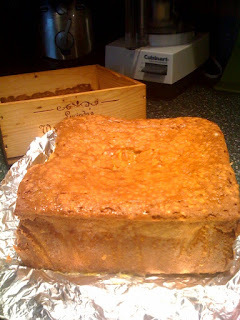 My friend Anne saw this recipe in the New York Times Magazine and decided to give it a try in a Lucinda's Wood Cake Box. Here's the recipe and the results! Juice of 1 lemon, strained. 1. Bring all the ingredients to room temperature. Preheat the oven to 300 degrees. Grease and flour a bundt pan (or your Lucinda's Wooden Cake Box), tapping out excess flour. 2. In a medium bowl, whisk together the flour, salt and baking soda. In another medium bowl, whisk the sugar to break up clumps. 3. In the bowl of a standing mixer fitted with a paddle attachment, cream the butter and shortening, stopping to scrape down the sides. Slowly drizzle in the sugar; cream the mixture well. Beat in the eggs one at a time, adding the next when the last has been incorporated. Mix in the vanilla. On low speed, mix in a third of the flour mixture until just combined. Add a third of the buttermilk, mixing until just combined. Repeat with the remaining flour and buttermilk. Add the lemon juice and mix to combine. 4. Pour the batter into the prepared pan. 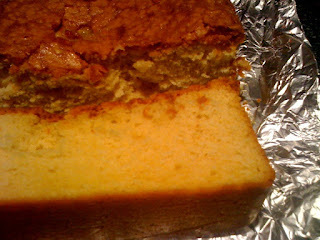 Bake until a cake tester inserted comes out clean, about 75 minutes. The top of the cake will be lightly browned, and the sides will shrink slightly from the pan. Cool for 20 minutes before inverting onto a cake platter. 5. Before serving, stir together the glaze ingredients and spoon over the top and sides of the cake. It’s even better the next day. Adapted from Cheri Cruze. Serves 10 to 12.